Brands always love to win awards, and its great publicity for them so team that with a beauty box you can build yourself with Latest in Beauty, and you get excellent exposure and hopefully more votes. 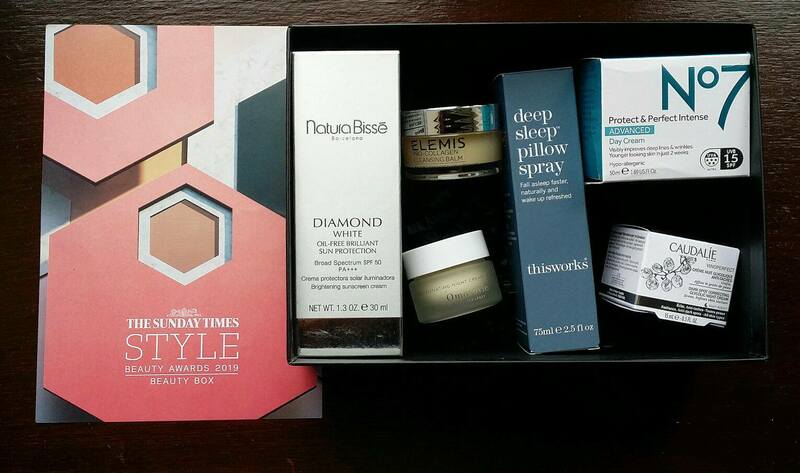 This year, The Sunday Times Style Beauty Awards has teamed up with Latest in Beauty for the second year to let the public build their own beauty box from some of the shortlisted products. There are 49 to choose from, and you can select 6 items for £30 plus £3.95 postage or you get free postage if you are a subscriber. It’s worth getting a subscription to save the postage, especially as you can a ‘build your own box’ of 6 items (Beauty Enthusiast) for £15 and get £5 off making it £10 with the code LIB5OFFBYOB. Among the 49 items are a combination of skincare, fragrance, make up, and hair care products to choose from. Some are full-sized, others are travel sized and sample sizes, and each works out to be £5 each. To be honest, last year the selection was far more varied than this year where there are fewer full-sized items to choose from with far more sample sizes on offer. In addition last year were brands that many people had not tried, whereas this year some of the items have been in various beauty boxes in the past year so people have already tried them, and to be frank, paying £5 for a 5ml sample that you have had free before isn’t such a great deal (Elizabeth Arden Eight Hour Cream Skin Protectant). Nor is the Sanctuary Spa Wet Skin Miracle 50ml, where the 200ml costs £8, so value can be a bit hit and miss. I decided to order one anyhow, but I did struggle to pick items I felt were worth it, and also that I would actually use or be able to give as a gift. Many people do like to try makeup items and the Charlotte Tilbury (even though it was only 1g) sold out quickly as well as the Burberry lip items, but to be frank, none of them were colours I would use and would see it as a waste of a selection. My selections are more skincare based, mainly because they offered better value and it’s easier to pass onto a friend if a product doesn’t suit, something you can’t really do with makeup for hygiene purposes. The Omorovicza and Elemis items are ones I already use, so they are handy extras, and the This Works Pillow Spray is always handy as a gift, and the No7 cream too. The Caudalie cream I was interested in trying and also the Natura Bissé which is something you really need to try before investing in it. My box has a perceived retail value of £190 so it was good value! Three of my selections are now out of stock, as it’s on a first come basis, but in terms of building your own box, this still represents good value as long as the items are ones that you will use or can give as gifts. However, last year was much better and I was slighty disappointed in the lack of choices available as several items had been already available in Latest in Beauty boxes over the past year. You can buy a Sunday Times Style Awards Box while stocks last, and also vote for your favourite products here.